STA Training is designed to make the Engineer or Designer understand the complete Timing SignOff strategies for successful and confident Tape-Out of the Design to the Semiconductor Fabrication House. Since timing is the heart beat of any chip, thorough understanding of timing concepts, development of Timing constraints are given through this STA Training especially when it comes to Ultra Deep Sub-Micron Technologies such as 28nm, 20nm, 14nm, 10nm. There are multiple parameters that decide how the timing of a chip would be functioning like Transition times of Clock phases and Data Path signals, Process and Voltage and Temperature (PVT) variations, Crosstalk noise affecting functionality of the chip, Crosstalk Delay affecting timing of the chip, which will be covered in greater detail in this STA Training. Other topics such as Advanced OCV, requirement of Clock path tweaking to meet desired frequency of the Chip will be discussed extensively in this STA Training. Pessimism inclusion when design is taped-out has been a norm to avoid any Silicon surprises but for higher frequency Designs on lower technology nodes, pessimism beyond a limit could be an over-do in which case pessimism-Removal is done through Path-Based Analysis rather than Graph based Analysis. This topic is covered with fine clarity in this STA Training. Above all, the fundamental part of setup and hold time fixing covering the above points are the key aspects of this STA Training. Tools used are Cadence Analysis Tool (Encounter Timing System or Tempus) for this STA training. Candidates will get access to tool both at institute and has option to connect to servers from home using Secure VPN to work on two SignOff projects hands on.Fixing of timing violations based on Sign-Off analysis for Multi Mode Multi Corner though ECOs would be across the breadth of this STA Training. Objective of this STA training is to shape graduating Bachelor’s and Master’s degree studentsas well as Physical Design Engineers explore opportunities in Block Level as well as Full Chip STA. Below are the STA Training topics. Timing DRC – Transition, Capacitance, Fanout fixes. 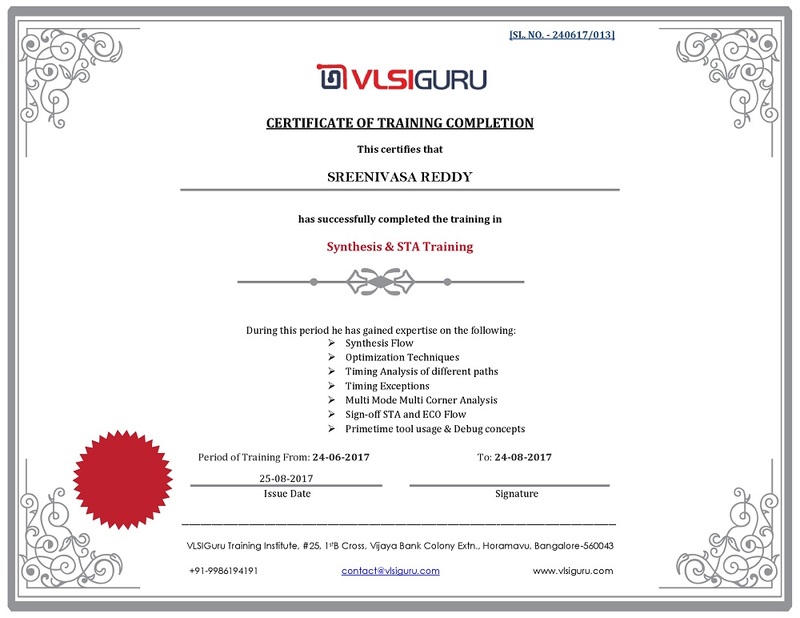 Synthesis Training covers the aspect of converting the design in form of RTL into Technology mapped netlist. Synthesis is an algorithm intensive task consisting of many stages within it requiring various inputs in order to produce a functionally correct netlist. The main part of Synthesis Training consists of reading in the design, converting RTL to Boolean equations through elaboration, then converting the Boolean equations to Generic Mapped Cells and then technology mapped cells from library, setting constraints, optimizing the design, analyzing the results and saving the design database for Placement and Routing stage to take on. Candidates who are interested in exploring opportunities in Synthesis and Front-end STA can undergo this in-depth Synthesis training to get good understanding of RTL constructs, Gate level Netlist, Constraint Development, Latch based designs, pipe lining and re-timing, basic Scan stitching, Setup timing closure, Topography based logic re-structuring, Wire Load Models, Logical Equivalence Checks. Hierarchical Synthesis is another key feature covered in this Synthesis Training Cadence Implementation Suite for Synthesis (as RTL Compiler / Genus) would be used in this Synthesis Training program. Candidates would get hands on work on two full designs. False path, Multi cycle path exceptions. Analyze & Debug the results . Constraining the design with SDC commands. 2:30PM – 6PM (Mentor guided lab and assignment session). Timings can changed based on majority of students request. Does course cover practical sessions on Synthesis ands STA usage? Course will involve practical exposure to Synthesis and STA with 2 hands on projects. Every session will have theory with supporting labs. 10+ years exp in top product company.